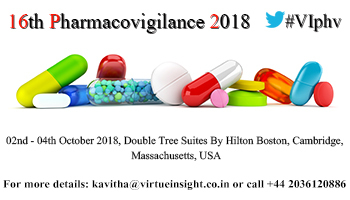 16th Pharmacovigilance 2018 will bring together top pharmaceutical, biotechnology and regulatory representatives under one roof that will address the key issues of the industry. The entire program will cover the detection, analysis and prevention of adverse drug reactions. It will be studied with the help of case studies and industry experiences. This conference will help the drug safety representatives from the pharmaceutical industry and academic and quality research organizations who wish to understand how to avoid common deficiencies in inspections by learning from the experiences of others; to gain a greater understanding of new and existing pv requirements, and to improve their organizations’ compliance with pv requirements. Also it can help you control your product’s lifecycle, your patient’s trust, and your revenue. Hence, this conference will provide an important platform for pharmacovigilance stakeholders to discuss and share best practices in expediting Pv development. Pharmacovigilance in the US: What comes next for the industry? Pharmacovigilance, Pharmacoepidemiology, Pharmacogenomics, Drug/Product Safety, Drug Development, Information and Clinical Data Management, Clinical Pharmacology, Clinical Safety, Periodical safety update Reports, Risk Management, Research & Development, Quality Assurance, Patient Safety, Signal Detection, Safety Surveillance, Outcomes Research, Data Analysis, Epidemiology, Medical Affairs, Regulatory Affairs and Compliance, Information technology, Sales and Marketing. Join us at 16th Pharmacovigilance 2018 and expand your knowledge of the latest business models and strategies in the high-level conference. Devise an immediate action plan for your biosimilar prosecution and litigation strategies in light of the barriers to entry, research and development costs, and regulatory hurdles, which are balanced against an enormous potential for increased profit margins.